It is a little frightening to be able to identify by satellite imagery a hidden nuclear facility in Iran. Iranian President Mahmoud Ahmadinejad said the facility was for “uranium enrichment” and was 18 months away from being operational. 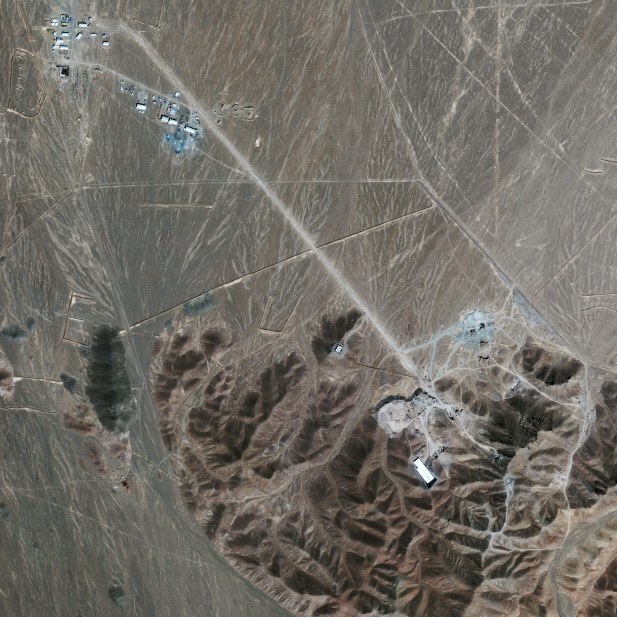 Satellite imagery company GeoEye has released a photo of what it says is this controversial and underground Iranian uranium enrichment site that was identified a week ago. ­Los Alamos National Laboratory and a New Mexico aerial technology firm on Thursday deployed a cutting-edge surveillance system­normally used to help U.S. conventional military forces in combat ­for a peaceful purpose: helping Las Conchas fire evacuees see an up-to-date view of their homes. A higher resolution version of the system, known as Angel Fire, was developed by LANL and the Air Force Research Laboratory for the Department of Defense. It’s described as a surveillance camera for a city-sized area, complete with instant replay and the ability to zoom in to see, for example, someone planting an improvised explosive device. Mapmaker Jamshid Kooros has published seven bird’s-eye-view, vue cavaliere (literally, “the view from horseback”) or isometric maps of Washington, D.C., Arlington National Cemetery, Williamsburg, Va., Paris, Versailles, Claude Monet’s home and garden at Giverny, France, and London. His latest tourist map is of Santa Fe, sketched in colored pencil. The Iranian-born, English-raised, American-educated architect who lives in Alexandria, Va. doesn’t like computers but he does use a digital camera and Google Earth maps to see how a location all fits. A full-color poster of Kooros’ map is expected to retail for under $15, with a smaller, four-fold map for $7 to $8. Both should be available via postersofsantafe.com or koorosmaps.com by March.